That flavor there would be Chocolate Oreo Birthday Cake Ice Cream. This Oreo addict's dream ice cream. I am drooling just looking at this picture. 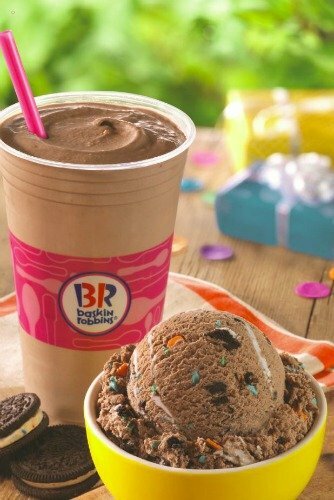 This is Baskin-Robbins’ new July Flavor of the Month, OREO® Birthday Cake, features chocolate cake-flavored ice cream with Birthday Cake OREO® cookie pieces, frosting bits, and a candy confetti ribbon. This flavor can be enjoyed by the scoop in a cup, cone, or as a milkshake. Also, guests can upgrade to a free, freshly-baked waffle cone with the purchase of a double scoop of their favorite flavor. Oh, wait think it can't get any better this summer? Let me one up you! Check this out. This is called a Polar Pizza. In other words an Ice Cream Pizza. Available starting July 1st at Baskin-Robbins locations nationwide, Polar Pizza, which is an ice cream treat guests, can eat like a pizza, is available in four delicious featured flavor combinations. You can get OREO® Cookies ‘N Cream, Peanut Butter ‘n Chocolate and REESE’S® Peanut Butter Cup, Jamoca® Almond Fudge and HEATH®, and Chocolate Chip Cookie Dough. 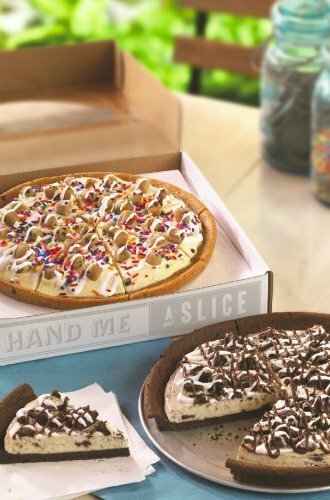 You can also have the option to create a customized Polar Pizza by combining a tasty Chocolate Chip Cookie or Double Fudge Brownie crust with their favorite ice cream flavor and any combination of fun toppings. Not that I have you wanting to run to your closest Baskin Robbins let me share the best part (in my opinion). Baskin-Robbins has partnered with the USO to bring you the best National Ice Cream Month USO promotion. Since National Ice Cream Day is on Sunday, July 17, Baskin-Robbins is proud to celebrate with guests nationwide by donating 75 cents from every ice cream float sold on that date to the USO in honor of its 75th anniversary. The donations will go towards supporting the USO’s mission of connecting America’s military to their family, home, and country, no matter the circumstances. 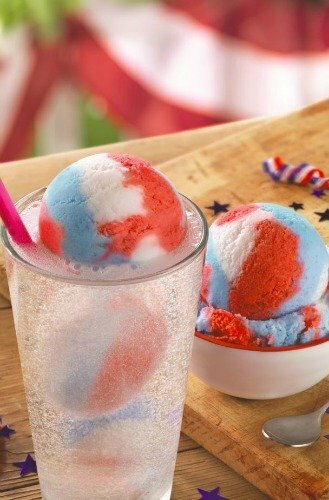 To help celebrate you can also enjoy the new USO Patriot Pop flavor, which is red, white and blue and features cherry, lemon, and blue raspberry-flavored ices, by the scoop or in a refreshing float. In honor of the USO’s 75th anniversary, Baskin-Robbins will donate 75 cents from every ice cream float sold on National Ice Cream Day (Sunday, July 17) to the USO in honor of all service members, veterans, and their families. Service members draw strength from connecting to the things they love and fight for – and one of the best ways to show our appreciation as a nation is through messages of support and gratitude. We’re asking everyone to take a moment out of their busy day to thank the more than 1.3 million active duty service members around the world. The USO strengthens America’s military service members by keeping them connected to family, home, and country, throughout their service to the nation. For nearly 75 years, the USO, a private, nonprofit organization, has served the men and women in the U.S. military and their families throughout their service. From the moment they join, through their deployments and as they transition back to their communities. Learn more about the USO at uso.org. WAIT!! IT gets even better. 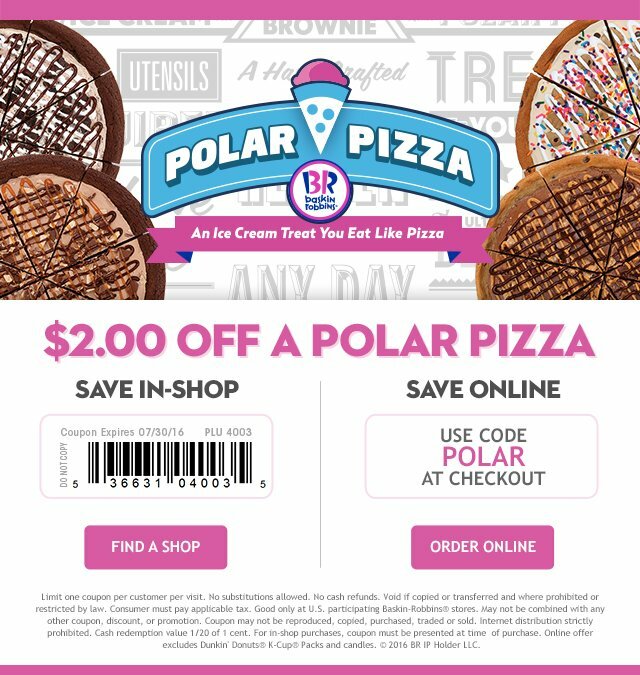 I am able to offer you this awesome coupon for $2 off a Polar Pizza. You can use it either online or in store. So check out the huge list of ice cream flavors that Baskin-Robbins has. Then head out on July 17th to support the troops. Follow Baskin-Robbins on Facebook, Twitter, or Instagram. This post was sponsored by Baskin-Robbins, all opinions remain my own.